Empowerment. 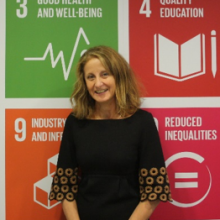 In 2016, her role was expanded to assume new responsibility for all areas of Supply Chain Social Sustainability in addition to continue leading its human rights agenda. Prior to joining Unilever, Ms Manubens was Corporate Social Responsibility Officer at PVH Corp., notably establishing one of the first Human Rights and Social Responsibility programmes in the early 1990s. Ms Manubens participated in initiatives to eradicate sweatshops and advance human rights. She was a member of the Fair Labour Association (FLA) Board of Directors and its Executive Committee and chaired the Board of Global Social Compliance Programme (GSCP) for three years. Ms Manubens gave testimony in the United States Congress as an expert witness upon the invitation of the Congressional Human Rights Caucus and represented U.S. business in the launching of the Global Report on Child Labour by the ILO at the United Nations. In September 2013 she spoke alongside the UK Foreign Secretary and the UK Secretary of State for Business, Innovation and Skills at the unveiling of the UK Action Plan to implement the UN Guiding Principles. Ms Manubens taught Business and Human Rights at Columbia University, New York. She has been a Board, Association and Advisory Group member on various organizations including Vice-Chair of the WEF Council on Human Rights and the International Council on Women’s Business Leadership (ICWBL). She is currently a member of the Consumer Goods Forum Social Sustainability Committeeand a member of the Advisory Group on Human Rights to the UK Foreign Secretary.